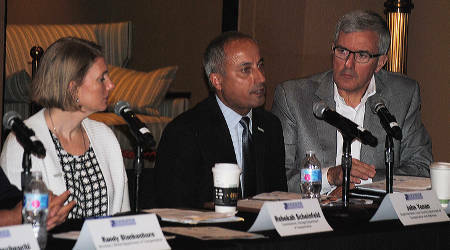 (From left) CDOT's Scheinfeld, Cook County's Yonan and AAR's Thompson addressed aspects of CREATE during the briefing. The Chicago Region Environmental and Transportation Efficiency (CREATE) program has been addressing train congestion in the nation’s busiest rail hub for the past 15 years. Driven by a public-private partnership among more than a dozen railroads and government agencies, the program has made headway in improving freight- and passenger-rail infrastructure to boost fluidity. Officials from several CREATE public-private partners held a program briefing and media tour July 11 in Chicago to highlight some of what’s been accomplished so far and provide an inkling of what’s yet to come. Although only about 42 percent of planned projects have been realized so far, program planners anticipate additional strides over the next several years. Estimated to cost $4.4 billion, the CREATE program involves 70 rail and highway improvement projects in northeastern Illinois, 29 of which have been completed. The projects are designed to address Chicago’s standing as the No. 1 chokepoint in the U.S. rail network, a city and surrounding metropolitan area that hosts about 760 passenger trains and 500 freight trains each day. The projects will enable the area to accommodate up to 50,000 additional freight trains annually by 2051, as well as more immediately reduce delays for Amtrak and Metra trains, and ease congestion for motorists and pedestrians. CREATE public-private partners include the Association of American Railroads (AAR) — which oversees the projects — the Illinois and Chicago departments of transportation, Amtrak, Metra, BNSF Railway Co., Canadian Pacific, CN, CSX, Norfolk Southern Railway, Union Pacific Railroad, the Belt Railway Co. of Chicago (BRC) and Indiana Harbor Belt Railroad Co. (IHB). The program briefing included the following panelists: Illinois Department of Transportation (IDOT) Secretary Randy Blankenhorn; Chicago Department of Transportation (CDOT) Commissioner Rebekah Scheinfeld; Cook County Department of Transportation and Highways Superintendent John Yonan; Amtrak Senior Manager for State Corridors Joe Shacter; Metra Chief Engineering Officer Bruce Marcheschi; and CREATE Program Chief Engineer Bill Thompson, who works for the AAR. The main topic of discussion was the 75th Street corridor improvement project (CIP), CREATE’s largest component that has four main work items. In June, the U.S. Department of Transportation announced the CIP would receive a $132 million Infrastructure For Rebuilding America grant. 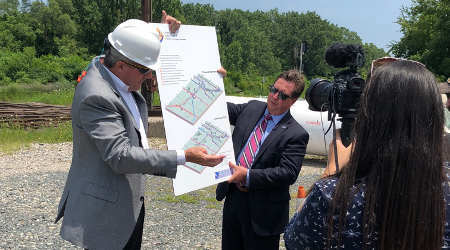 The CIP includes work that would take place at the busy Forest Hill Junction, where a series of diamonds separate east-west and north-south freight and passenger train traffic. 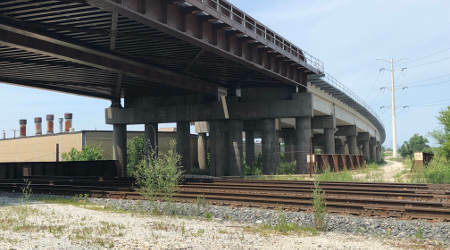 The proceeds will be used to help fund the Forest Hill flyover to eliminate conflicts between north-south and east-west train movements at a very busy rail junction near a CSX yard. In addition, the grant will go toward improvements to the Argo and Canal junctions to address a chokepoint, work to increase capacity at IHB’s Argo Yard and a new grade separation on a CSX line at 71st Street. Estimated to cost $447 million, the CIP also will be funded by $116 million from six Class Is (BNSF, CP, CN, CSX, NS and UP), $111 million from IDOT, $78 million from Cook County, $23 million from Metra, $9 million from CDOT and $5 million from Amtrak. 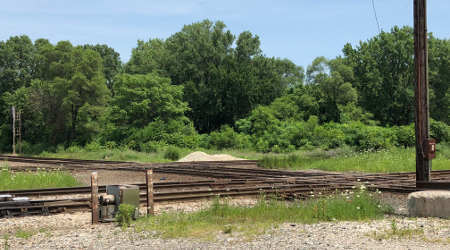 Next year, work is slated to start on the Argo Connection, which involves new double track, crossovers and signals between the BRC and IHB/CSX line at Archer and 63rd in Summit, Illinois, to accommodate higher train speeds. Design and construction work on the other three main projects will follow. The CIP is vital to Metra to help reduce freight- and passenger-rail congestion, said Marcheschi. Up to a 50 percent reduction in Metra train delays are expected after the projects are completed over the next several years, he said. Thompson (left) and Marcheschi described details of the planned Forest Hill flyover during the media tour. “We’re in the business to move trains and not to hold trains,” said Marcheschi. The CIP in turn will free up more slots for Amtrak Cardinal trains by eliminating freight-train conflicts in the vicinity of 80th Street. Amtrak ultimately decided to become a CREATE partner since the national intercity passenger railroad predominantly operates on infrastructure owned by freight railroads, said Shacter. The tour that followed the briefing included five stops, with a key one off 75th Street at CSX’s Forest Hill Yard so planners could promote the CIP and the much-needed Forest Hill flyover. Rising as high as 23 feet, the flyover will reduce or eliminate train conflicts at the area’s most congested rail chokepoint, where 90 freight trains and 30 Metra trains cross paths each day and five tracks funnel down to two, said the AAR’s Thompson and Metra’s Marcheschi. A series of diamonds at the junction are used by CSX, CP, CN, NS, UP and BRC freight trains. To begin in spring 2019 and take more than four years to complete, the flyover also will provide environmental benefits since fewer trains will be sitting and idling while waiting to cross the junction, Thompson and Marcheschi said. The Forest Hill flyover will resemble the Englewood flyover (shown), a three-track bridge that was completed in 2014. An old rail bridge is visible in the background at right. 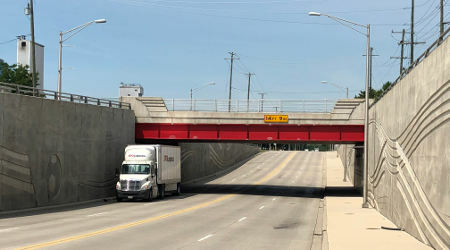 To provide attendees a visual reference for the planned Forest Hill project, the tour stopped at the Englewood Flyover, a three-track bridge completed in 2014 that separates freight and passenger train traffic at 63rd and State streets. The flyover replaced a crossing between Metra Rock Island tracks and NS tracks over which 78 Metra trains and about 60 freight and Amtrak trains crisscrossed each weekday. In addition, attendees viewed a grade separation on 71st Street in Bridgeview near Toyota Park that was completed in 2013. That bridge helps improve safety for people attending soccer games or concerts at the popular venue. Event goers sometimes crawled under stopped trains to get to Toyota Park. The grade separation also eliminates conflicts between 80 CSX and IHB trains and 4,400 motorists each day. Long train and road traffic delays previously were common after events. A bridge was built near Toyota Park in Bridgeview in 2013 to separate track used by CSX and IHB from a busy roadway. Another tour stop: the site of a planned $65 million grade separation on Columbus Avenue. IDOT is providing $49 million for the project, which will involve either an overpass or underpass to eliminate daily conflicts between 11,500 motorists and dozens of trains moving on three BRC tracks. Work is projected to begin within the next few years. One of the tour’s last stops provided a glimpse of work completed to improve viaducts along 75th Street to help benefit nearby communities. Over the past decade, CREATE partners have focused on improving roadways, sidewalks and drainage under railroad viaducts to enhance safety and security for motorists, pedestrians and bicyclists. 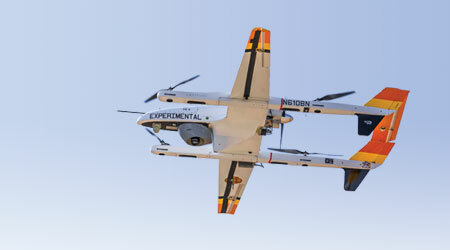 Overall, about $1 billion has been spent on the CREATE program, with another $1 billion committed by partners or governments, leaving about $2.4 billion yet to be funded, said the AAR’s Thompson. 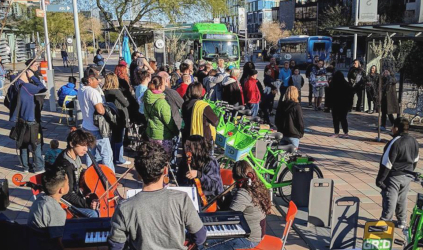 Although no completion date has been set for the entire program, the goal is to continue moving various projects through the environmental, engineering and construction phases. “We still have a lot of work to do,” said Thompson.